My goal is always to help you have the best experience with improv both in class and out of class! Just getting started can be the hardest part, so I’ve written a quick overview of what you can expect from your first class. 1. Everyone is nervous. I promise. The most important thing to know before your first class is that everyone, both introverts and extroverts, feel nervous their first time. Seriously. I have welcomed hundreds of students to their very first day of improv Level One, and I can say without a doubt that the energy at first is a mix of anxiety and fear. The great news is that everyone involved in this experience wants you to make friends, be creative, and have lots of fun along the way. I understand those seem like pretty lofty goals when you’re starting from a place of anxiousness and fear, but we always get there! 2. We have fun ASAP! There’s something about waiting for a new class to start that can make seconds feel like hours, so we like to get everyone on their feet and playing as soon as they walk in. You’d be surprised at how quickly the energy can change just by getting everyone out of their chair and into a circle. That’s one of the things that is so special about improv. It doesn’t require any special skills when you walk in the room— just an ability to listen and respond. You won’t be spending long amounts of time listening on “how to be funny”– that’s never our goal, we want you to feel free to jump into the deep end with both feet first. We start playing super easy and fun games immediately! 3.We create a supportive and trusting atmosphere right away. The first day of improv class is a lot like the first day of kindergarten. We start with the basics and slowly grow your comfort zone by playing lots of fun games with the goal of making you look AMAZING. No game will single you out or put you on the spot without giving you ample time to experience lots of success. And for those over thinkers out there, we remind you again that we are playing and discovering— there are no “right” answers. 4. You are in charge of the discoveries that you make. We will ask you lots of questions along the way and we truly are interested in what you have to say and what you are finding fun, challenging, new, and exhilarating along the way. Every class is like a conversation, and your teacher’s goal is to listen to and build on all the things that you are feeling. So share and ask questions whenever you want. Discover out loud! Improv is a group activity and we all help each other learn and grow together. 5. You may feel awkward at times. Most people don’t know anyone in the room. You are going to play games with strangers (soon to be best friends) that are silly and goofy and sometimes challenging. I am certain that your inner critic might discourage you. It’s happening to all of us. We are experts at helping people build confidence and courage through play. In improv, we teach the concept of saying“Yes! And…” which will quickly help you quiet the inner critic and focus on the games and the moments of fun. We invite all students to “Yes! And…” the feelings of critique so that they are able to move past them and have more fun. You’ll get it. Everyone does! Two hours will fly by a lot faster then you can imagine because you will quickly feel connected to your fellow classmates and invested in making them look awesome. You will have shared laughs, victories, and a little bit of yourselves along the way….and you won’t be able to wait until next week to do it all again! 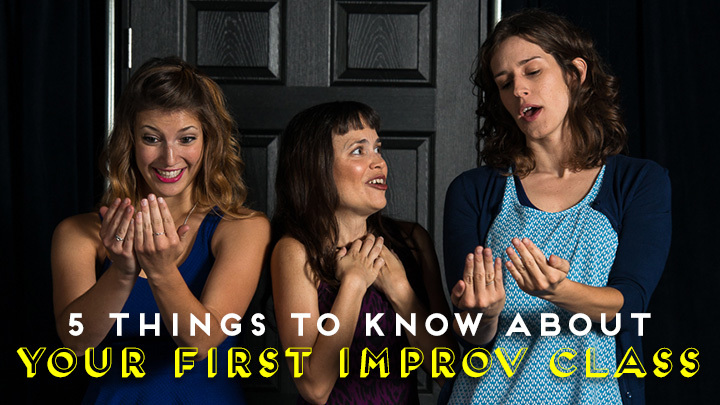 We have all walked into our own first improv class ever and know the feelings you think before you arrive, and want to make sure that you have a great time discovering the world of improvisation.We guarantee more joy in everyone’s lives and we mean it! We invite you to take a big leap and say “Yes! And…” to this awesome adventure. We got your back, and can’t wait to meet you. Kat Brown is the director of community engagement at Finest City Improv and a master level 1 teacher. She loves helping people find joy and transformation through improvisation. You can see her performing with Killer Giraffe or coaching the musical improv team Minor Suspension. She will also be greeting you on your first day of class–usually wearing polka dots! Wow, it’s a great article. I’m too shy and I’m looking something that helps to get rid of it. These improvisions clases are a good option for me. The best thing is the first lesson begins from basics and then step by step plays and discoveries during lessons lead to success. Now I’m sure I’ll be able to change my life. I’m excited, ready to give freedom and spontaneous expression to my inner fun child.